On February 27, 2006, Saab unveiled an ethanol-powered grand tourer concept which suddenly, dramatically and finally gave new meaning to that trampled and misused slogan — Born From Jets. 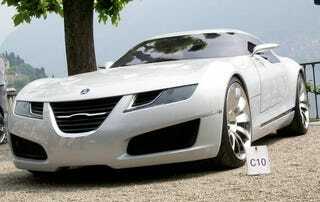 Unfortunately, concept is what the beautiful Aero X would remain. It was supposed to receive a twin-turbocharged V6 engine running on pure ethanol, good for a whopping 650 HP. I saw the car in person at the 2007 Concorso d’Eleganza Villa d’Este, that ultra-swanky car show on the shores of Lake Como. Like every concept car, this was to be looked at and not listened to: a cacophony of sad creeks and snaps enveloped its carbon fiber silhouette as it emerged from its trailer, ever so slowly. Most 650 HP sports cars are useless but the Aero X was designed to be a proper tourer: the engine was up front, giving ample storage space behind the two seats, underneath a rather fantastic rear end. I have never been a Saab person but the Aero X was breathtaking to look at. A white spectre of a car with not a single superfluous line, it melted into the early morning mist coming off the lake. Saab’s aerospace origins translated into a proper 180° canopy with no A pillars. The wide rear tires suggest plenty of grip. Also: no silly Lambo doors here to make life a pain in low-slung parking garages. Here’s the canopy in action as the Aero X is paraded before the jury. The doors, the 180° canopy and the glass roof are a single piece, lifted up and forward by hydraulics on a massive hinge. The canopy also saves you from having to perform supercar acrobatics upon egress. And just look at the killer time these guys are having!